While I wasn't especially trying to cut corners or build to minimums, I was trying to be mindful that space is at a premium, and so things like the thickness of the floors was going to directly affect the height of my ceilings. 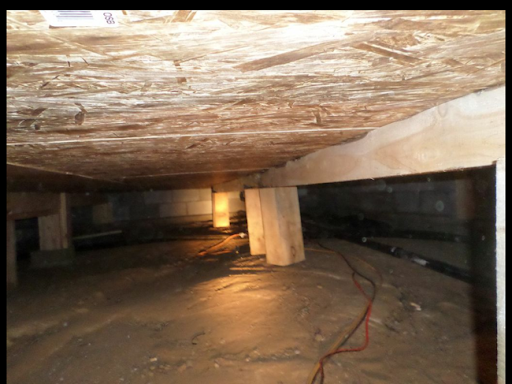 With this in mind, I consulted carefully my building code books, and they suggested that two by six joists should suffice for a ten foot span. In practise, this turned out to be inadequate in my opinion. It wore on my nerves more and more to have Donna and Kenny walk past me, shaking the table and everything on it as if we were riding a train! 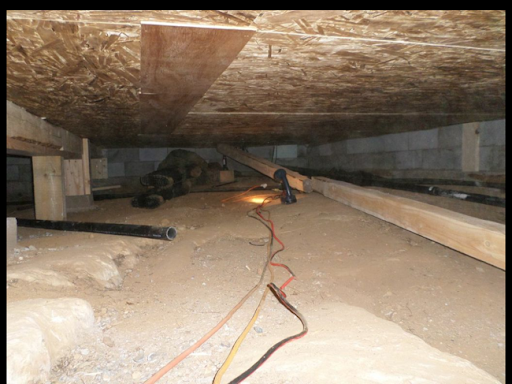 I began plotting to install a beam (or beams) in the crawlspace perpendicular to the floor joists, centred on the open space, reducing their span to about the four to six foot range. I had a large pile of one to three foot long six by six beams left as off-cuts from building the cabin, so I was happy to use them as upright supports under the beams. Serendipidously, I came into possession of four, four by four inch beams in the nine foot long range. 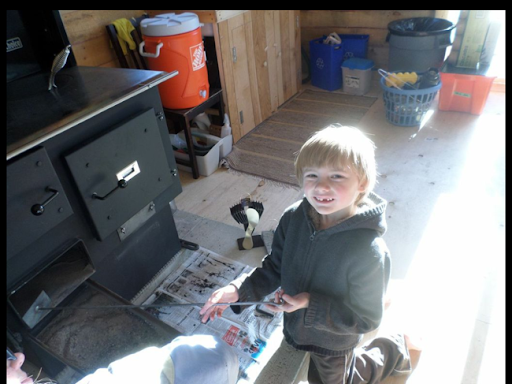 Grandpa came over to assist, and we knocked out the ventilation screen in one corner of the cabin to allow the beams to be inserted into the crawlspace. I plan on also using this opening to insert the ABS pipe that will replace the bathroom drain line. 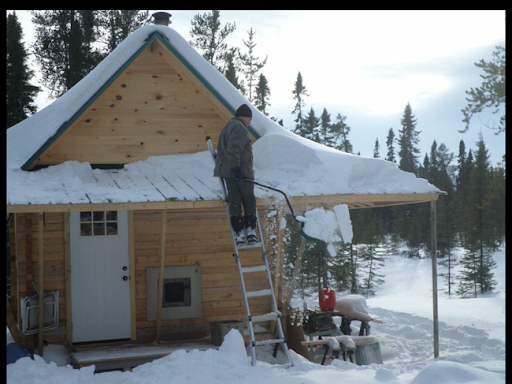 Grandpa slid in the four beams, and then waited outside while I set two aside for one half of the cabin, and two more in position under the main living side of the cabin (the south-west side). I positioned the first beam, and then jacked it into position. I took as accurate a measurement as possible and Grandpa proceeded to use my Stihl to cut a six by six to the proper length. I jammed it under the end of the beam, and then moved to the other end with the jack to get ready for the next support. We repeated this process four times in all. I butted the beams in the middle of the space, and then came upstairs to a delightfully solid floor. It was a rather dusty job indeed! Grandpa was ready to go home to stoke his fires, so we held off on installing the other two beams for now. I left the jack down below, and we'll likely try to tackle this chore sometime this week. I think I will try to also do the water drain line at the same time. Strangely, in the loft we have the same span and two by six floor joists, but it doesn't act as noticeably bouncy, so I'm not inclined to try to come up with any sort of solution at this point. We'll see if that needs to change in the future, but for now I'm happy to deal with things as they present themselves. In case any of you missed out, we recently got hit by a combination of the famous Alberta Clipper, as it clashed with a Texas Low. This resulted in a day of continuous snowfall. Luckily, it coincided with the Olympic Hockey semi-final of Canada vs. the U.S.A. In any case, it left a huge pile of snow that took loads of work to make a passable path down our laneway. 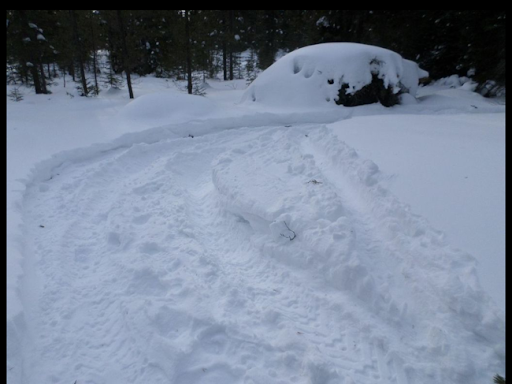 Thank goodness for the ATV though - it was so much easier to plough with it, and I believe it even is able to push snow further and higher than the tractor. A grader blade just isn't that good for snow, especially when you have to drag it behind you, rather than pushing in front. The other place it left snow that was harder to deal with was on my bush trails. I can't get the ATV onto them with the blade, even at the best of times, so I have been packing them down with snowshoes, leaving them a few days, and then trying them with the ATV. This process has been working well so far, but it was disheartening to imagine the amount of wading I would have to do to recreate my trails after the latest dumping. Grandpa and I had dumped a few dead, dry trees at the front of our property, in the small boggy area between our two driveways. We hauled them to the edge of our laneway, and then I thought I'd try to drag them to my woodsheds. Luckily I decided to do a dry run on the ATV first. 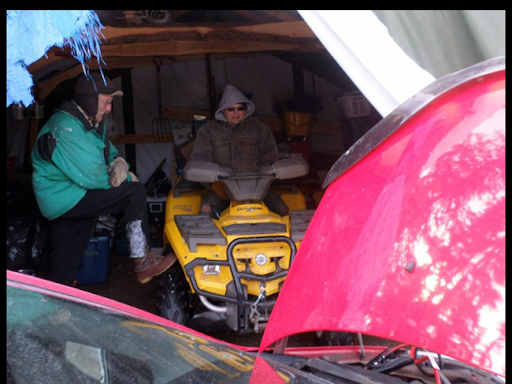 Donna helped me to push, pull and winch out the ATV, and then she tramped the trail a bit more with her snowshoes after I managed to get the ATV back to the dojo tent. 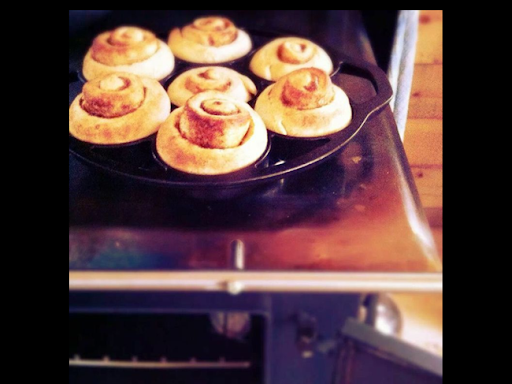 I suppose I haven't written much about cooking on the woodstove lately, so as per my one request, here's a few things we've noticed. The top of the stove discolours very rapidly in use. It isn't unaesthetic, it just loses its stainless finish quickly while under heat. 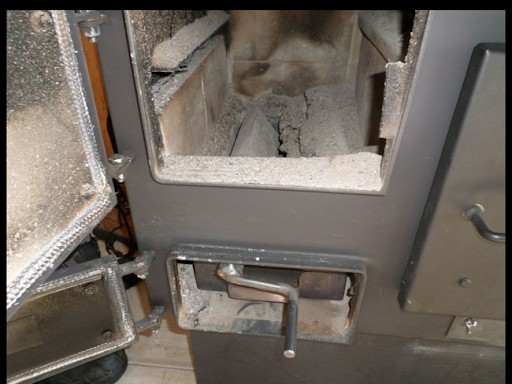 Depending on how hot-burning the wood is that you use, and how you arrange the ventilation into the fire box, you can obtain quite a bit of heat, or frustratingly little. Donna feels that with the oven door shut, the stove doesn't give off nearly as much heat to the cabin. I'm not so sure, but we haven't done any tests of even a rudimentary nature to find out if this is true. The instructions for the stove certainly DO recommend that one leave the oven door open if the stove is to be used as a space heater. With the oven door shut, it hasn't been particularly difficult to attain extremely high temperatures in the oven box. We often "bury" the thermometer needle. 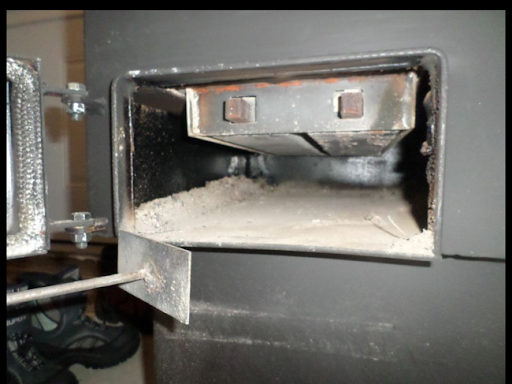 In these cases, we have cracked the oven door open for a few minutes until it settles down closer to the suggested temperature for whatever we have inside. While most of our baking has been limited to frozen entrees, the arrival of Aunt V! was a time for her to flex her baking skills - with awesome and delicious results! Luckily Donna took notes, and I'm sure we'll soon be drowning in tasty treats! Ha! The very instant I sat down to type up this blog post I got immediately distracted as a large Lynx just wandered past our patio door only a few feet away. Donna and Kenny both were able to silently approach to get a good view themselves and we're all excited to have had the chance to enjoy our first encounter through that view. Immediately I retraced the prints of the lynx, and we saw that it passed directly in front of the cabin, including the kitchen window where Donna was busy cutting up some chicken for supper tonight - she'll have to be less focused on her work in the future if she wants to catch these moments more often. This title MAY be misleading, as I am only revisiting the thought of a winter road across the ravine, but recent events have made me a bit more optimistic about it. 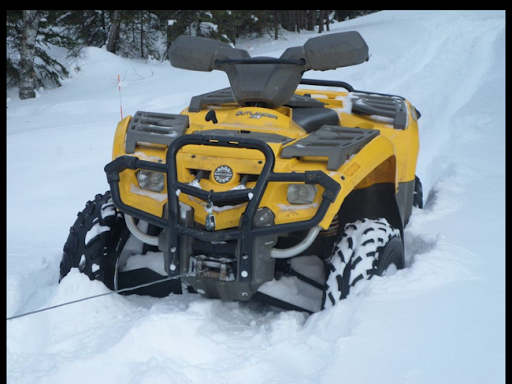 A few days ago the temperature finally warmed up above the minus fifteen mark, and I felt that I had a fighting chance at getting the ATV going. We have had very little snow since Christmas, and virtually none since I first purchased the ATV. With no excuse to start it up, I found that when I actually wanted to put it to work, the machine was not interested in catching. I eventually ran down the battery, and shelved the idea for another day or two, waiting for a chance to get to town to purchase some longer jumper cables. Each vehicle currently has about a six to eight foot cable, but the ATV has a battery in the back, and I had backed her into the tent last time I had her out, so I couldn't access the battery without combining cables, something I wasn't interested in doing. The local department store had a set of sixteen foot cables at a good price, so I brought them home and eagerly hooked up the ATV to our Echo. It took many tries to finally get it to start. My final success came by following Grandpa's suggestion to turn the choke off, but then as soon as the engine caught, I turned on the choke until I found the sweet spot. With the ATV running nicely, I opted to try to see if it could struggle its way to the edge of the ravine, an endeavour we had previously rejected when we got repeatedly stuck on the established path to the top of the hill leading down into the ravine. In the two weeks following my adventures with the ATV getting stuck, I had continued to walk on the trail, noting that it seemed to be growing firmer and firmer as time went on. It appears that while packing down the snow with my snowshoes isn't immediately effective, after some further time passes, the snow "hardens" up significantly, and I shouldn't lose heart so quickly. This time I was able to take the ATV directly to my top of the hill turnaround without any problem and this really boosted my confidence. I backed slowly down the path to the edge of the ravine, and then proceeded out about fifteen feet onto the ravine path without incident. I was pumped. If I didn't have an alternative mission, I would seriously have considered trying to go right across the ravine and then follow the ravine path. Instead, Grandpa showed up with my bucksaw and Fiskar's splitting axe and proceeded to fell one of the dead but standing spruce trees in the ravine. 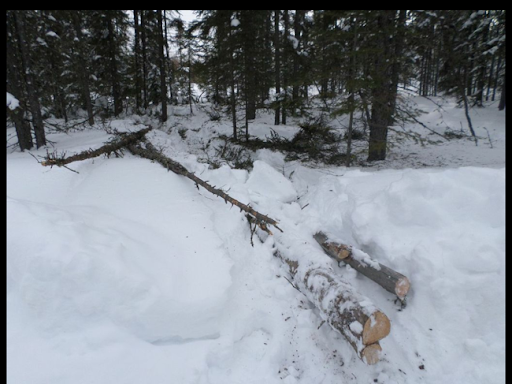 After dropping the tree and helping me to buck it, I chained it to the ATV and handily dragged it back up the hill to my wood processing area. I was really tickled. Taking his leave, Grandpa headed back to his place to stoke his fires, and I returned to the edge of the ravine to haul out the next tree. This time I was a little more careless, and on the way down backed off the path and got stuck. The winch made short work of that situation, but I still got stuck two more times before I managed to find a firmly packed path to the edge of the ravine. 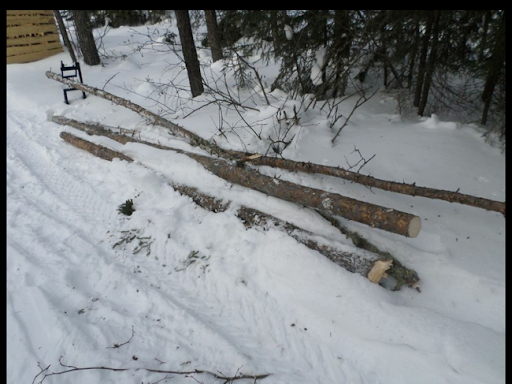 I cut down the next tree, slightly larger than the first, and decided to haul it out in two trips. The first one went uneventfully, but the second time the ATV was no longer able to gain traction on the hill out of the ravine where I had torn up my path noticeably when I got stuck those three other times. I disconnected the tree, winched myself up the hill, then reconnected the tree on a long chain and dragged it up the hill in that manner. By this time I had had enough for the day. I was excited and humbled at the same time. I am hoping that after another few days the trail will firm up again and perhaps even the places where I slid off will also become less treacherous. 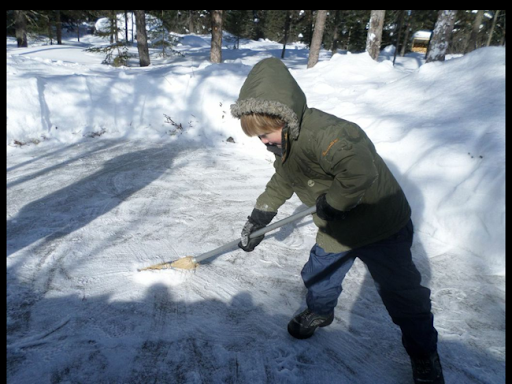 I headed back to the cabin, taking a detour to our pond when I saw Donna and Kenny shovelling off the ice in preparation for a visit from Aunt V!. We are so excited to host her and make her part of our household, if only for a longish weekend. She's always fun and a great role model for Kenny. 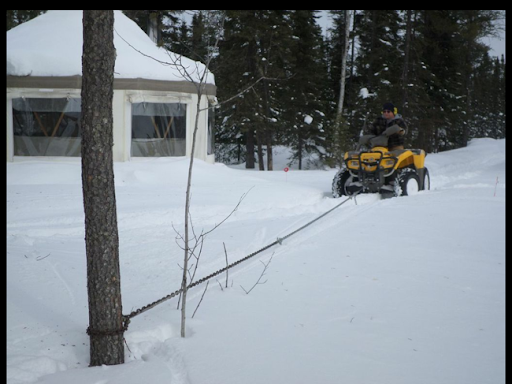 I pulled Kenny along the entire snow road on our sled to help smooth out the ruts and pack it further. 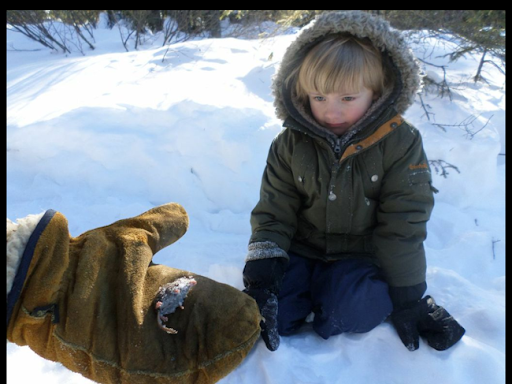 He took one spill and laughed through a faceful of snow. We certainly earned our hot chocolate that day! First off, I should make it clear that while I was involved last month when Donna and I cleaned out the stove for the very first time, I was a lazy lump this time around and it was all Kenny and Donna who dealt with this dusty, (slow but perhaps bound to get quicker as we get more comfortable with it) job. Based on previous experience, we would suggest cleaning the stove from the higher areas first, and working your way down to the bottom. First off, lift the right hand ring and get the ashes that build up on top of the oven box. It's worth noting that Suppertime Stoves (the manufacturer of the Baker's Choice) supplies this handy cleaning tool with the stove. 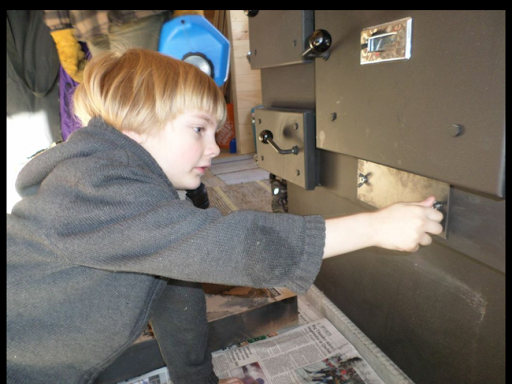 Next up is the firebox itself. 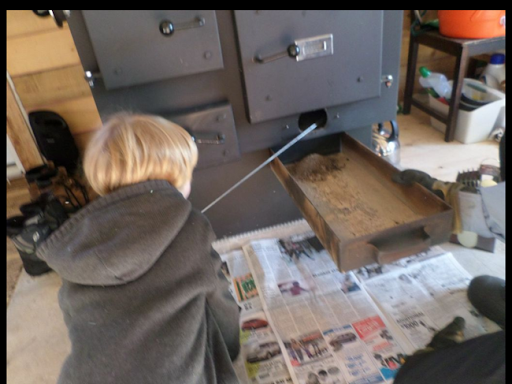 Even though the instructions make it sound like the bottom grates are intended for use with coal, we found them very handy to "rock" when cleaning - it drops most of the ashes down into the ash pan below. Remove the pan, and then you can clean the area around and under where the pan sits. Spreading lots of newspaper on the floor helps a lot to control the ashes. Note the cute nose photobombing the lower left of the picture. 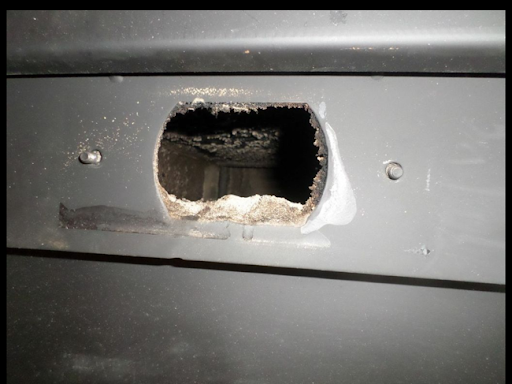 With that finished, unscrew the plate under the oven box to reveal the access hole there. It takes a bit of a knack to feel around under the box, as there are some obstacles. 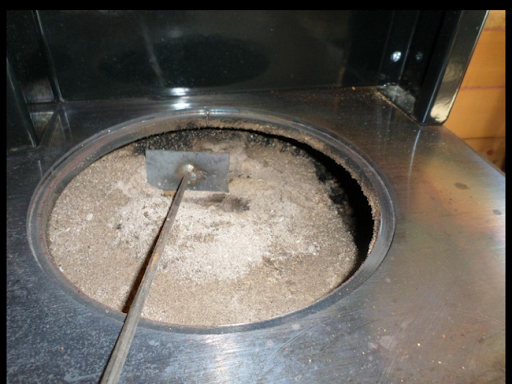 It also behooves one to try to extend the cleaning wand into the smaller box under the stovepipe to clean out the ashes that may accumulate there. 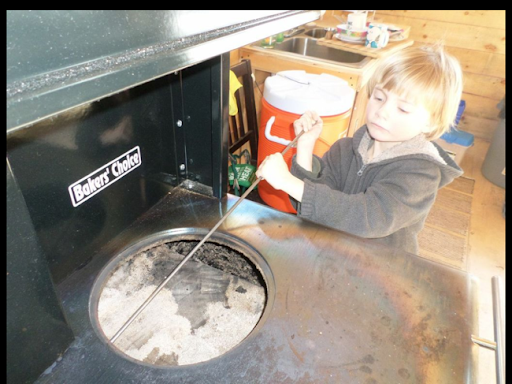 But, with that taken care of, you are treated to a clean, hotter burning, and safer stove to serve as the heart of your cabin! Looks like the cold won. I was very enthused about how well things had worked out finally in the sauna, through the combination of updated drain lines, as well as the new technique of ensuring that water wasn't "trickling" through the pipe for hours after the sauna had been finished. As such, I picked up three more twelve foot lengths of the inch and a half ABS pipe and enough couplers and fittings to allow me to do a similar update in the cabin. Early the next morning, I suited up and headed outside, where I used the snow shovel to dig out the corner of the cabin in the approximate location of the existing drain lines. 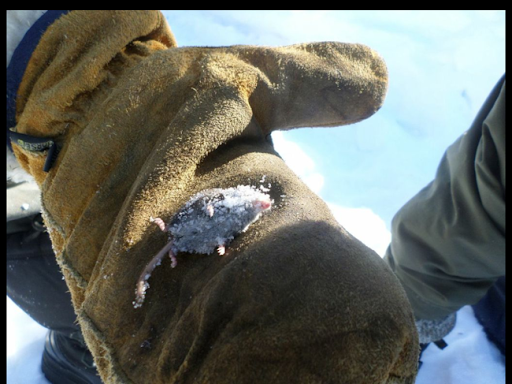 Once I got down to the frozen earth, I headed over to Mummu and Grandpa's to borrow Grandpa's pick axe. Grandpa suggested using his grubbing axe instead, and that he would deliver it personally. 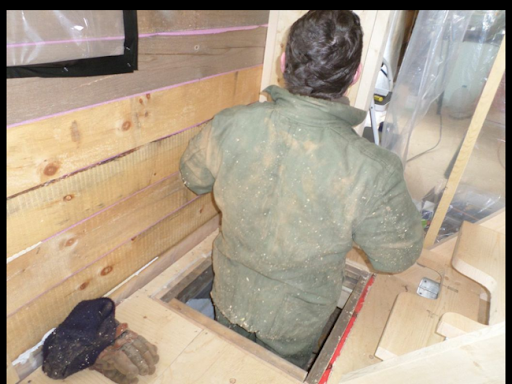 With him doing most of the grubbing, he dug out the drain lines and I went down under the cabin to cut off the poly pipe drain and get ready to put together the new line. I took down the ABS cement - unlike in the sauna, this water had the likelihood of being smelly and dirty - and so I wanted there to be no chance of leaks. I cut off the existing line, and noted that it was still frozen even up close to the floor. Donna delivered a thermos of steaming hot water, which I soaked the end of the drain in until I noticed that there was more water running out of it than could be explained by melt. Suddenly, a large gush of (nasty smelling) water flowed out as the drain finally emptied for the first time since late November, early December. YUCK! I rolled around in a stunted attempt to stay away from the ever growing puddle under the cabin. Luckily it was only a small amount of water, and the flow stopped quickly. Grandpa heaved the first length of pipe through the foundation, and I pulled it completely inside and set it aside, realizing that two lengths should be sufficient. This length I would employ later to drain the bathroom. The next one I had him shove in as far as where I was stationed, then I glued on the adapter to convert it to my poly pipe. With that in place, I helped him guide it inside and glued on a coupling. He then rammed in the final piece and I glued it to the second one. I dragged myself over to the stub of poly pipe still dripping under the kitchen sink, and bellowed for Grandpa to shove in the last of the pipe. Calling out the feet and inches remaining, we finally had everything lined up perfectly, and I, for once, remembered to slide on the pipe clamp BEFORE connecting the pipes. I guess after a hundred or so connections, one finally learns. The hookup went smoothly, and I headed back to the trap door at the bottom of our stairs and climbed out, dusty and aching, but otherwise excited. I headed under the kitchen sink and reconnected the drain line there to my satisfaction. 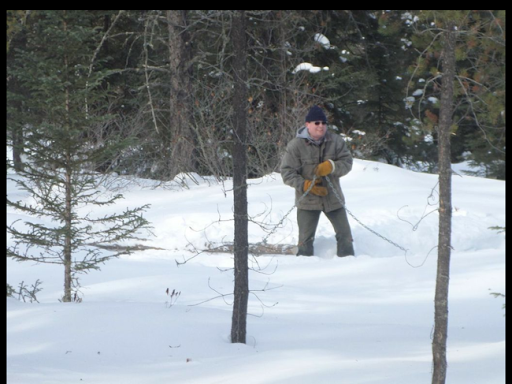 With that done, I checked on Grandpa, where he was trying to ensure a good trench from the end of the pipe to the slope beyond the cabin. We hummed and hawed for awhile, convincing ourselves that the water would "never" be able to freeze and backup that far. Meanwhile, Donna had completed a load of laundry in the Panda, and so had a bucket of room temperature, dirty water, waiting for me to carry out and dump. I was ever so clever, and just dumped the whole thing down the sink with mounting fear that perhaps I could have tested my system with less than twenty litres of water. Oh well, in for a penny, in for a pound. I didn't hear anything from outside, so I rushed out, calling to Grandpa repeatedly "do you see anything?!". Finally, when I got right beside him, he said "yeah", and there it was, delightful water flowing out! And when it finished, no drip, drip, drip to freeze up! That is one blessing of the way water in the cabin will likely be used - it will generally be room temperature or warmer, and when it is sent down the drain, it will be as a single gush, not a steady drip. As such, I am even more optimistic in it not freezing up. Of course, it feels like I've typed these sentiments a hundred times before in previous blog posts. It is with sincere hope that I record these failures so anyone else can avoid them by learning from my trials. Actually, that's one of the big reasons I'm writing this whole blog! So that anyone who comes later can see what did (or more likely, didn't) work for me. In any case, as I write this, it has been a few days of unmonitored usage of the new drain in the cabin, and it still is working fine. That's a real treat. My worries are that come spring, the ground at that corner of the cabin may smell a little funky, as we are flushing our dishwashing water into that area. There is nothing toxic there at all, but there are bits of food certainly in that water that I'm not sure how readily it will decompose, or worse, attract critters. If that's the case, then I will have to either add an extension on, or rebury the end of the pipe. For now, I'm happy to have it exposed so that I can readily see if it is blocked or not. As you all know, I have a problem. A problem that the majority of my readers can't relate to, but the majority of the world likely can. I don't have running water in my home. Neither in, NOR out. But I'm working on it. 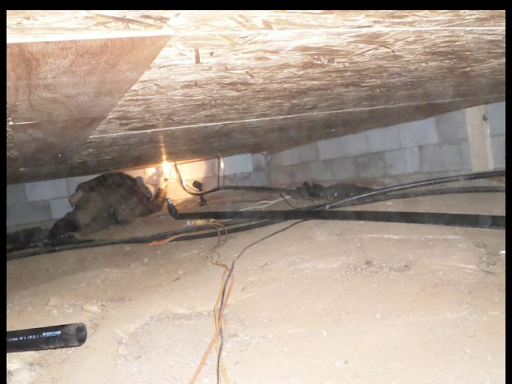 I returned to the cold, dark, dirty confines of the crawlspace under the sauna, and dismantled all of my lovely ABS pipes. Grandpa used my sledge hammer and a piece of pipe to drive the existing pipe back into the sauna, opening up a larger hole in my footings. Upon closer examination, I noticed that the electrical cord that connected the generator to the cabin had broken exterior insulation, so I replaced it altogether. I brought my pipes up into the sauna, where I covered them in insulation. I then replaced the four foot final length with a six foot one, to ensure that the drain water would not be exposed until it was beyond the footings of the sauna. 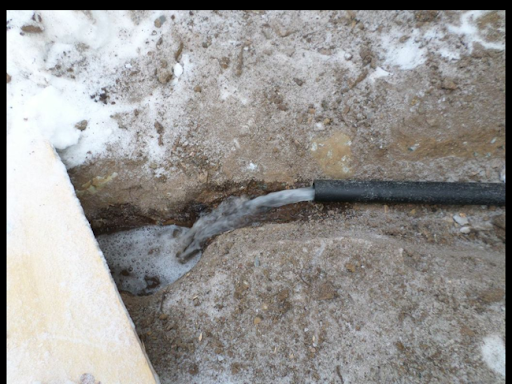 We thawed out the places where the existing pipes were frozen and then replaced everything. I poured a few cups of hot water through, watching it emerge outside, and we declared victory. The big observation we made was that there was a fair amount of water in the frozen pipes, even though after the last sauna, we had seen water flowing through the pipe at the end of the sauna. Where did the water come from after we left? This renewed effort had two results - it has encouraged me to try the same thing in the cabin to allow us to drain water there (We're currently schlepping buckets that are kept under the sink) - and I also pulled the washing machine out of the sauna and brought it into the cabin to thaw out. We have spent the past couple of months doing laundry VERY sparingly over at Mummu's, or at the laundromat in town. Mummu's washing machine/dryer finally threw in the towel a few weeks ago, an event we feel at least partially responsible for because we obviously increased the laundry load on it in recent times. While Mummu let me help Grandpa install the new washer/dryer, she declined our offer of helping to pay for it. In any case, the Panda had lain dormant for the past two or three months in weather ranging between twenty and thirty below. 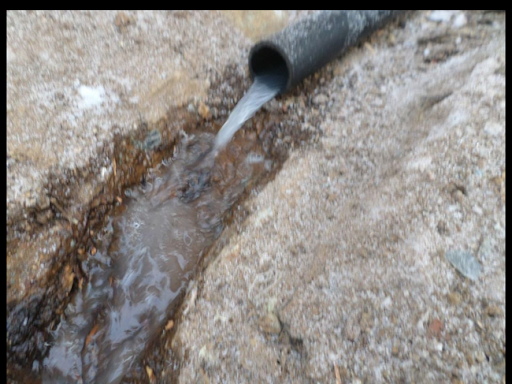 The most significant fear was for the fact that it had done this with a bit of water in the bottom that didn't get pumped out before our final freeze-up. Fearful that the agitator motor or spinning motor or pump had been damaged by the freeze, or perhaps the base had cracked under the pressure, we observed the washing machine closely as it thawed out; prepared to relegate it to the outdoors if water began leaking onto the floor. The washer held and so with some trepidation, I poured in a pail of water, some pairs of socks and underwear, and some soap nuts. I twisted the dial, and low and behold - agitation! After six minutes (the amount of time I usually select, although the Panda timer can go up to fifteen), I switched it to drain (with the outlet hose in the now empty pail I had used to fill it), and some dirty, foamy water began pumping out and into the pail! Success! Finally, after a quick trip to the sauna to retrieve the plastic disc you put on top of the clothes in the spinner, I transferred everything to the spin side and set that for two more minutes of spinning. This went as normal, although I think I agree with one amazon reviewer who suggested that after being "broken in", the spinner doesn't quite remove as much water as it does the first few times it is used. 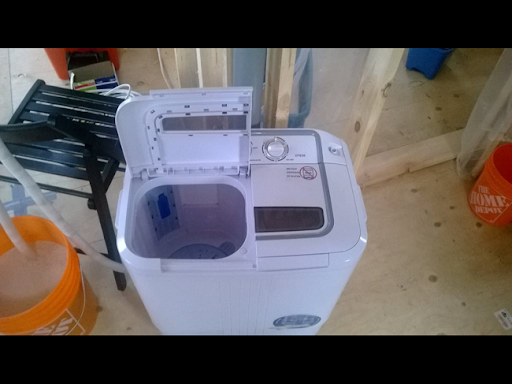 The clothes still come out as dry as you would expect from a traditional washing machine's spin cycle, but they didn't seem as amazingly dehumidified as the first time I tried it. In any case, I have to admit to being really impressed that this little machine could have been as abused as it was, and it still came back without missing a beat. For the remainder of this winter, I believe we'll keep it in the cabin. It will likely be more convenient this way. I'm not sure where it will wind up for the future, but wherever it is, it currently is on track to have a special place in my heart.